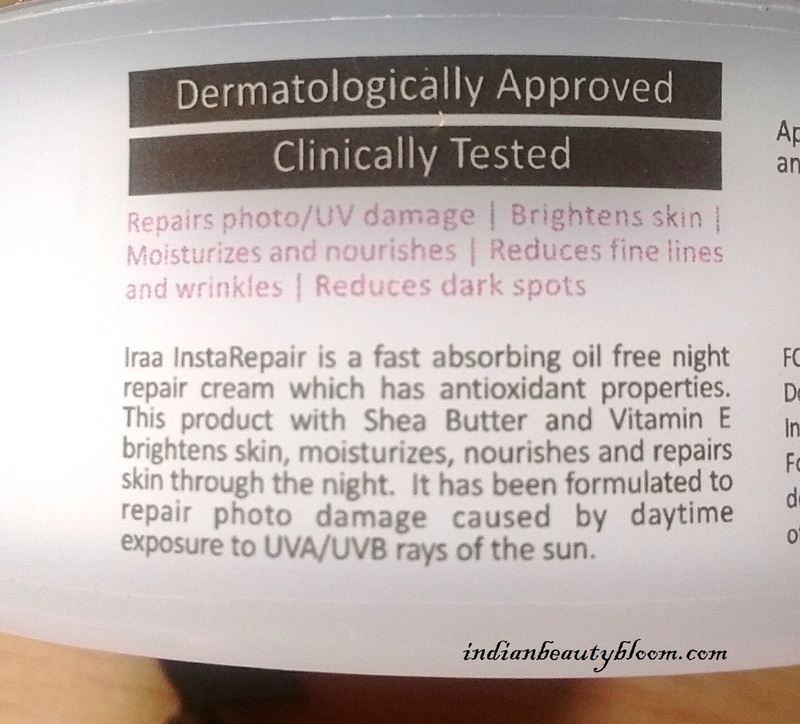 Back with one more product review from brand Iraa . 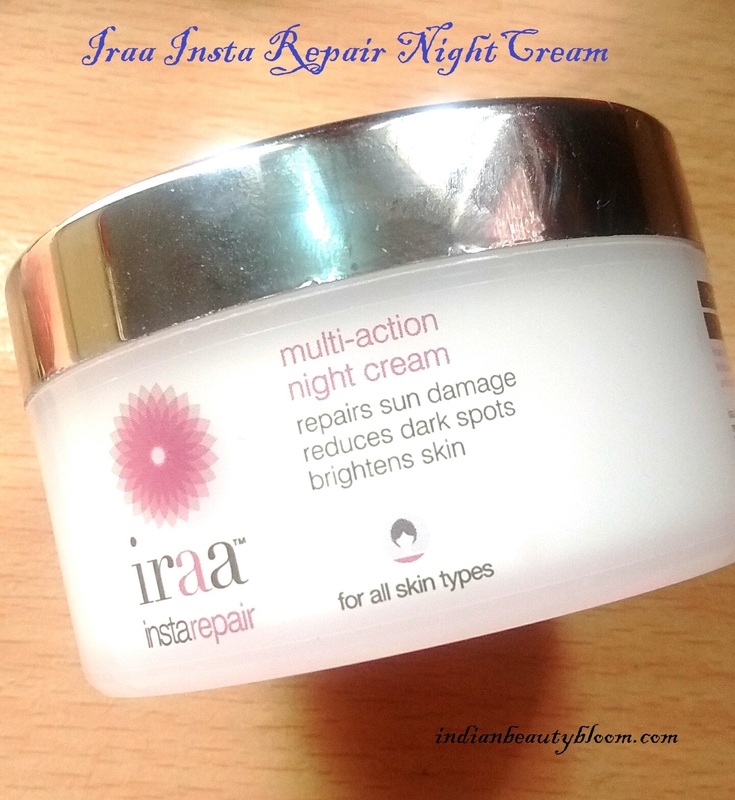 Today I am going to review it’s Insta Repair Multi Action Night Cream . 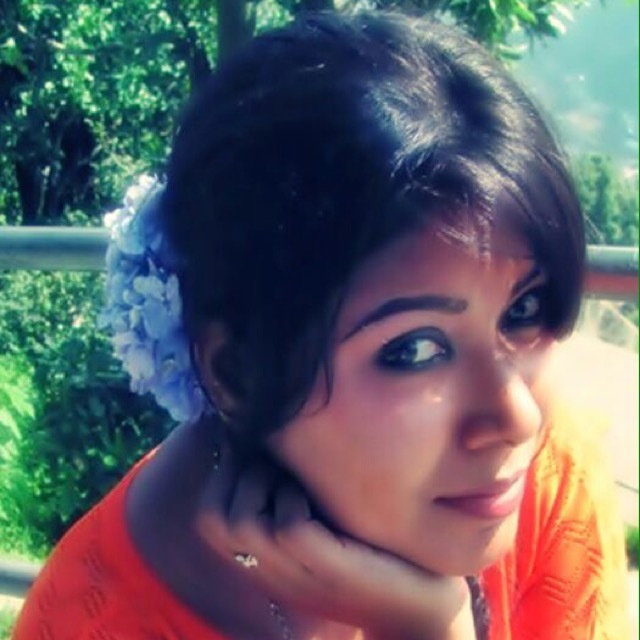 Iraa is an Indian brand which has wide range of products for Skin care & Hair care . It’s Products are made from natural ingredients and are Cruelty free. 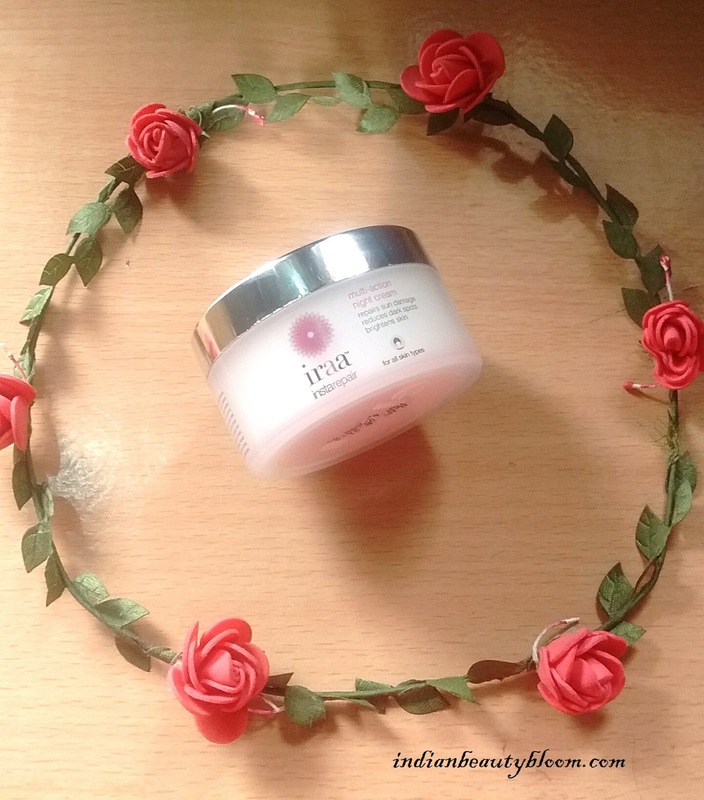 This Insta Repair Night Cream is an Excellent product from Iraa with goodness of Shea Butter , Pentavitin , Extracts of White Mulberry , Paper Mulberry , Japanese Camellia , Green Tea etc . 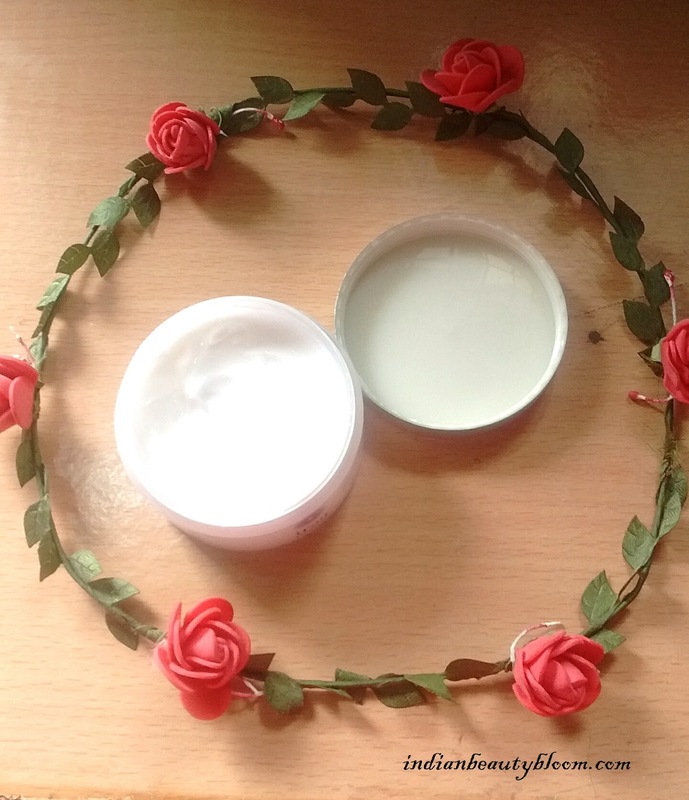 It moisturizes and brightens the skin and protects from harmful UV rays . This Night Cream comes in a tub with a silver lid which looks classy . 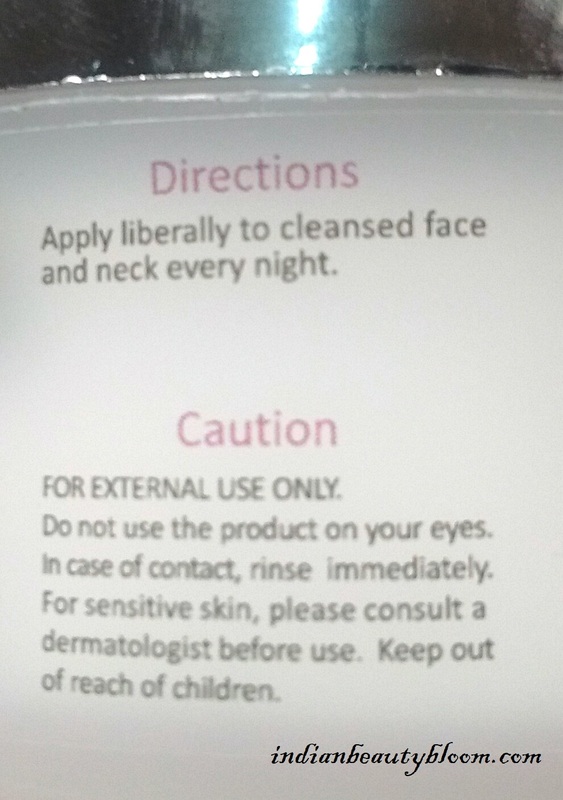 One needs to apply this cream on a cleansed face and neck every night . 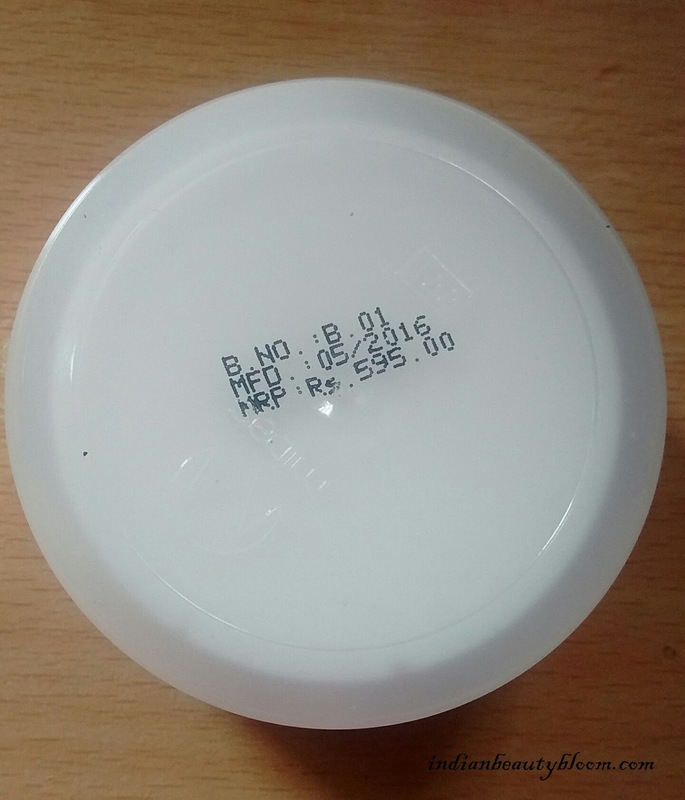 The product is a thick white cream with a nice fragrance . 1. Contains Shea Butter which is good for skin . 2. Contains Vagestop which is a blend of seven natural extracts including Japanese Camellia , green tea leaf etc. 3. Contains Pentavitin which acts as anti oxidant , makes skin healthier and smoother . 4. Product does what it claims , Moisturizes the skin , and makes it smoother and healthier . 5. Has a nice fragrance . 6.Clinically tested and Dermatologically approved . 2. Price may seem bit higher but it’s Okay since it’s an excellent product with so many good ingredients . When I applied this on my face initially it seemed too sticky but after a good massage it got absorbed in skin completely and my skin felt good . In the morning my face looked fresh and soft . After using it for few days I Must say it’s an excellent one . Since I have not used it for a long period of time I can’t say about it claims of reducing fine lines etc but this seems to be a Promising One .